FDIC List of Problem Banks up 30%: On Tuesday, August 26, 2008 the Federal Deposit Insurance Corporation (FDIC www.fdic.gov) announced in its quarterly banking report that their list of "problem banks" (see "Problem List" below) for the second quarter of 2008 increased 30% from to 117 financial institutions. The 117 institutions on the problem list is the largest number since the middle of 2003. Total assets of institutions on the problem list increased 200% from $26 billion to $78 billion. $32 billion of this $56 gain came from IndyMac Bank, F.S.B., Pasadena, CA, which failed in July. Reported net income of member institutions fell 86.5% or $31.8 billion to only $5.0 billion, the lowest earnings for the industry except for the fourth quarter last year (2007) and the fourth quarter of 1991. "By any yardstick, it was another rough quarter for bank earnings, but the results were not unexpected as the industry coped with financial market disruptions, the housing slump, worsening economic conditions and the overall downturn in the credit cycle." said FDIC Chairman Sheila C. Bair. This decline in the banking industry is reflected in the Economic Cycle Research Institute's (ECRI) Weekly leading index which has fallen to a 28-year low, the lowest reading since June 13, 1980. Provisions for loan losses continue to be the main cause of falling earnings. "Rising levels of troubled loans, particularly in real estate portfolios, led many institutions to increase their provisions for loan losses in the quarter. Loss provisions totaled $50.2 billion, more than four times the $11.4 billion the industry set aside in the second quarter of 2007. Almost a third of the industry's net operating revenue (net interest income plus total noninterest income) went to building up loan-loss reserves." Noncurrent loans are up 20% to 2.04% of all loans. The number continues to rise quickly to the highest level since 1993. "The amount of noncurrent loans and leases (90 days or more past due or in nonaccrual status) increased by $26.7 billion during the second quarter, following a $26.2 billion increase in the first quarter and a $27.0 billion increase in the fourth quarter of 2007. Almost 90 percent of the increase in noncurrent loans and leases in the last three quarters consisted of real estate loans, but noncurrent levels have been rising in all major loan categories. " Assets of insured member institutions declined. "Total assets of FDIC-insured institutions declined during the quarter for the first time since 2002. The $68.6 billion (0.5 percent) decline was caused by a reduction in trading assets at a few large banks. Assets in trading accounts, which increased by $135.2 billion in the first quarter, declined by $118.9 billion (11.8 percent) in the second quarter. In addition, the industry's holdings of one- to four-family residential mortgage loans fell by $61.4 billion (2.8 percent). Real estate construction and development loans declined for the first time since 1997, falling by $5.4 billion (0.9 percent)." The FDIC's Deposit Insurance Fund reserve ratio fell. "Due to a significant increase in loss reserves, including reserves for failures that have occurred since June 30th, the DIF balance fell to $45.2 billion at the end of the second quarter, down from $52.8 billion at the end of the first quarter. While insured deposits rose only 0.5 percent during the quarter, the decline in the fund balance caused the reserve ratio to fall to 1.01 percent as of June 30th from 1.19 percent one quarter earlier. Because the reserve ratio is now below 1.15 percent, the Federal Deposit Insurance Reform Act of 2005 requires the FDIC to develop a restoration plan that will raise the reserve ratio to no less than 1.15 percent within five years." 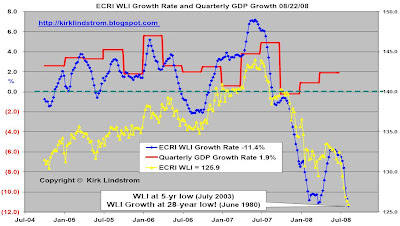 Make sure you read the attached "August 2008 Fixed Income Report" to see my graph of ECRI's WLI growth rate vs. the DJIA. You can see WLI growth started its plunge well before the stock market peaked last summer. The Q2-2008 PCE (Personal consumption expenditures) price index remains high and was unchanged at up 4.2%. "Real gross domestic product -- the output of goods and services produced by labor and property located in the United States -- increased at an annual rate of 3.3 percent in the second quarter of 2008, (that is, from the first quarter to the second quarter), according to preliminary estimates released by the Bureau of Economic Analysis. In the first quarter, real GDP increased 0.9 percent. The GDP estimates released today are based on more complete source data than were available for the advance estimates issued last month. In the advance estimates, the increase in real GDP was 1.9 percent (see "Revisions" on page 3). Real exports of goods and services increased 13.2 percent in the second quarter, compared with an increase of 5.1 percent in the first. Real imports of goods and services decreased 7.6 percent, compared with a decrease of 0.8 percent. Kirk: The weak dollar led to lower imports and higher exports. A weak economy also leads to lower imports. Since what we imported fell by 7.6%, then 7.6% is added to GDP. Had Q2 imports remained flat, GDP would have been 7.6% lower or negative 4.0%! To find out how I've profited greatly from these difficult market conditions, subscribe to "Kirk Lindstrom's Investment Newsletter" today! 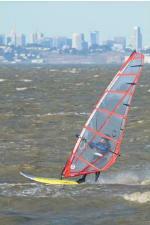 Subscribe NOW and get the August 2008 issue for FREE! The acceleration in real GDP growth in the second quarter primarily reflected a larger decrease in imports, an acceleration in exports, an acceleration in PCE, a smaller decrease in residential fixed investment, and an upturn in state and local government spending that were partly offset by a larger decrease in inventory investment." Jobless claims for the week ended 8/23 fell 10,000 to 425,000. 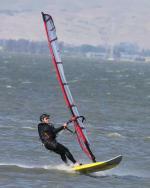 Subscribe TODAY and get the August 2008 issue for FREE! CNBC's Ron Insana (profile and photo courtesy of CNBC) is folding the tent on his Insana Capital Partners L.P. hedge fund called "Legends." On August 8, 2008 sent a letter to his investors to announce they were closing shop and taking a job with Steven Cohen of SAC Capital. "Our current level of assets under management, coupled with the extraordinarily difficult capital-raising environment, make it imprudent for Insana Capital Partners to continue business operations." "His clients would be invested in SAC Capital, managed by Steven A. Cohen; Icahn Partners, managed by Carl C. Icahn; or the Renaissance Technologies Corporation, run by James H. Simons, perhaps the most successful hedge fund manager on the planet. These funds are typically closed to the public." Insana raised $116 million and "only" lost 5% over a period the S&P500 fell more than 15%. This is good performance for someone like me who writes an investment newsletter that tries to beat the S&P500 but that is not the type of performance hedge fund investors pay for. To get the big fees, hedge fund investors expect their managers to have been short the market and show a profit. Of course, readers of my blog know I think market timing is next to impossible to do over and over so I rely on asset allocation and stock selection, but there seems to be an endless supply of suckers who will pay huge fees to take excessive risk. Hedge funds are great things to manage especially if you get the standard 2% of assets plus 20% of profits fee structure. The fee structure only benefits the manager and encourages excessive risk taking. For example: A savvy hedge fund manager could offer two funds called "Red Fund" and "Black Fund." He could take 2% of funds collected for both then take the money for each fund and put them on the red and black bets at Las Vegas. If Black comes up, he would get 20% of the winnings from the black bet plus the 2%. Even better, he'd be able to market that fund again to the investors to get more money to do it again since he was so successful. Of course the Red Fund investors would be very unhappy to have all their money vanish. 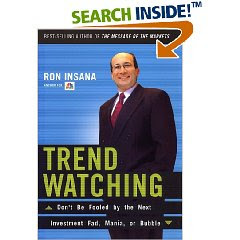 Ron shows an extreme level of arrogance as a commentator on CNBC so it must hurt him to have been caught in the hedge fund bubble after writing a book called “Trendwatching: Don’t be Fooled by the Next Investment Fad, Mania, or Bubble." I guess even the smartest people find the huge fees available to hedge fund managers hard to resist. I hope people read these stories like this to be reminded of my advice to use the "core and explore" type of investing. The fees for "core and explore" are tiny for your core portfolio made of index funds plus an explore portfolio where you try to beat the core portfolio with 5 to 20% of your funds with my newsletter fee and commissions to buy stocks your only additional fees. United States Inflation Data for June and July 2008 released during August 2008. Personal consumption expenditures (PCE) increased $57.1 billion, or 0.6%. The PCE price index increased 0.8% in June, compared with an increase of 0.5% in May. The PCE price index, excluding food and energy, increased 0.3%, compared with an increase of 0.2%. Real PCE, PCE adjusted to remove price changes, decreased 0.2% in June, in contrast to an increase of 0.3%t in May. The Consumer Price Index for All Urban Consumers (CPI-U) increased 0.5% in July. The July level of 219.964 (1982-84=100) was 5.6% higher than in July 2007. On a seasonally adjusted basis, the CPI-U advanced 0.8 percent in July, following a 1.1 percent increase in June. The index for energy rose sharply for the third straight month, increasing 4.0 percent in July and accounting for about half of the overall increase in the all items index. Core CPI, the index for all items less food and energy, increased 0.3 percent in July, the second straight such increase. Led by higher by prices for food and energy, the U.S. Producer Price Index, PPI, soared 1.2% in July. This 1.2% gain was four times higher than the average of economists guesses of 0.3%. Abstract: Both the Bureau of Labor Statistics (BLS) and the Bureau of Economic Analysis (BEA) produce measures of the change in prices that consumers pay on the goods that they consume. While these measures tend to agree in broad historical trends in prices, they sometimes give different pictures of inflation over short horizons. There are several reasons why these two indexes differ. First, the two indexes use different formulas. For the period in question, the CPI is a Laspeyres index, while the BEA product is a Fisher Ideal index. Second, the two indexes have different underlying concepts. The BLS product measures the prices paid by (urban) consumers, while the BEA product measures the prices of final consumption goods, wherever they are purchased. Finally, even when there is significant agreement across indexes in the broad outlines of coverage, differences in how the detailed components are implemented lead to differences in how prices are measured and differences in the weights attached to specific series. We quantify the magnitudes of each of these factors. There is no one “smoking gun” that explains the discrepancy between the indexes. Rather, the overall discrepancy is the result of the accumulation of a number of small effects. Today NanoViricides Inc. (more NNVC Charts) reported that HIVCide-I was significantly superior to the Current Anti-HIV Three Drug Cocktail currently used to treat HIV/AIDS. HIVCide-I may be a "functional cure cure for HIV/AIDS." 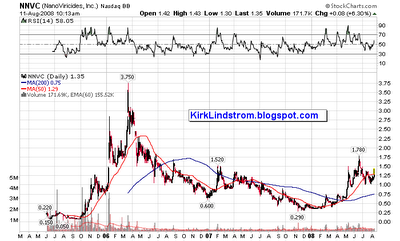 NanoViricides Inc has a market capitalization (at $1.33) of $158 million assuming 119 million shares outstanding. My dream is a big American drug company like Johnson & Johnson (JNJ), Pfizer (PFE) or Merck (MRK) buys NNVC for maybe $5 billion. I would even be happy to have the technology leave the US if a big foreign company like Bayer, GlazoSmithKline (GSK), Novartis (NVS), Sanofi-Aventis (SAN), Hoffmann–La Roche (SWX Europe: ROG) or AstraZeneca (AZN) paid more. Press Release from NanoViricides, Inc.
T. Boone Pickens Comments on Oil and Yahoo! Billionaire oilman T. Boone Pickens was on CNBC today. Here is a synopsis of his comments about oil (charts) and Yahoo (YHOO). Boone said demand for oil is being killed in the US and Europe so the price of oil has come down. Joe Kernan asked Pickens "you paid for the Swift Boat ads and now the left is using your 'we can't drill our way out of this' statement. How do you feel about that?" Boone said. "You can't drill your way out." "You have to have everything." "Anything American I am for." "I'm for Biofuels. I'm for electric. I'm for hybrids. I'm for OCS. I'm obsessed with it. I'm going to get the $700 billion figure (the amount Americans send to foreign governments to buy oil) down. "Anything American, I want to do it." Boone is still long oil but he says his positions are "not as long" as they are before. That is not very long. With oil now at $117, buying a $70 call was good but he locked in a $15 gain by selling a call at $85 which left the additional $32 of upside ($117-$85=$32) on the table. If oil stays above $85 before his options expire, his gains from being "long" are the premium from selling the $60 put plus the $15 call spread. In a past appearance, he said he was short oil at about $100 and I believe he said in another appearance he covered that short around $108 for a loss. Pickens may believe $85 was the high end of oil's trading range without a speculative bubble. This would agree with another noted oil analyst Charlie Maxwell's belief that oil would trade between $50 and $80 and hit $85 by 2010 (see "Charlie Maxwell Interview by Bob Brinker - Sept. 2007"). "I got out of Yahoo!" "The management is pathetic." He said if you give them a multiple choice question they get the wrong answer every time. Pickens wants to work as a general for either McCain or Obama so he can be nonpartisan in helping with the oil crisis. After attending several town hall meetings, Pickens says people in America don't believe they are being told the truth about energy in America. Pickens said he will be back as a guest in about a month. Martin B Anstice, Chief Financial Officer (CFO) at Lam Reasearch (LRCX charts) just purchased half a million dollars of his company stock. Nobody should know the financial condition of a company better than its CFO. When a CFO buys a significant number of shares, people should pay attention. This purchase is significant because it is the first insider transaction in many years. Disclaimer: I have been accumulating LRCX in my newsletter (testimonials) and personal portfolios since buying in 1998 at a fraction of the current price. In an attempt to increase my overall return, I plan to continue trading around this core position which has long ago become "house money." Today it only takes 12.33 ounces of gold to buy the DOW! CDs have been a "safe haven" for those wishing to preserve assets and get a small inflation adjusted return. See "Very Best CD Rates with FDIC" for a list of the best rates and terms. You can get over 5% at Discover Bank if you are willing to tie your money up for five years. You can get a one year CD paying 4.25% at Wachovia Bank. 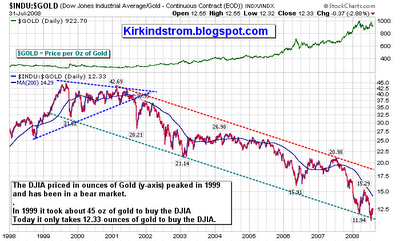 With the DOW:Gold ratio now at 12.44, it is trading near the bottom of the green zone in the second chart. "It is also interesting to note that the magnitude of the current bear market (when adjusted for inflation) is approximately 60% of what occurred during the dot-com bust of 1999 to 2003." 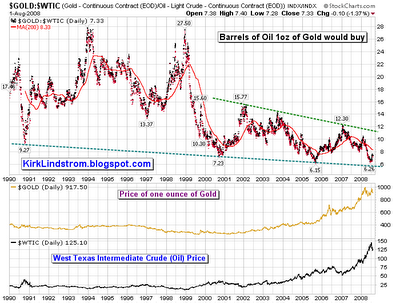 This last chart of the Gold/Oil ratio shows how many barrels of oil an ounce of gold will buy. Both are international commodities. 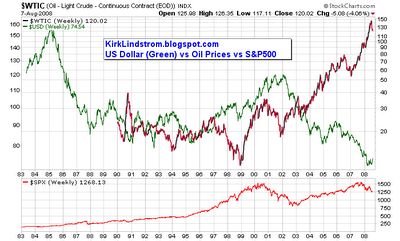 This ratio tends to cancel out the US dollar as both gold and oil are priced in US Dollars. More on "Symetrical Triangle" chart patterns: The Bible for technical analysis, Technical Analysis of Stock Trends, by Robert Edwards and John Magee, says about 75% of symmetrical triangles are continuation patterns and the rest mark reversals. This book makes a great Father's Day Gift! 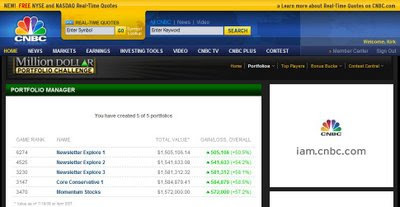 How did you do in CNBC Million Dollar Portfolio Challenge? The contest ran for 10 weeks from May 12, 2008 to July 18, 2008. Contestants started with a million dollars in play money and they could earn "bonus bucks" by answering trivia questions which could be found at CNBC Bonus Bucks Trivia Answers. My successful strategy was to remain conservative in the bear market (200 day moving average is resistance rather than support in bear markets) by keeping a large cash position then buying the big dips and answer the daily trivia (answers here) questions. I was too busy to actively trade it so I did not "sell the pops." In my newsletter, I "buy the dips" then "sell the pops" to lock in quick profits on shares I trade around core positions. 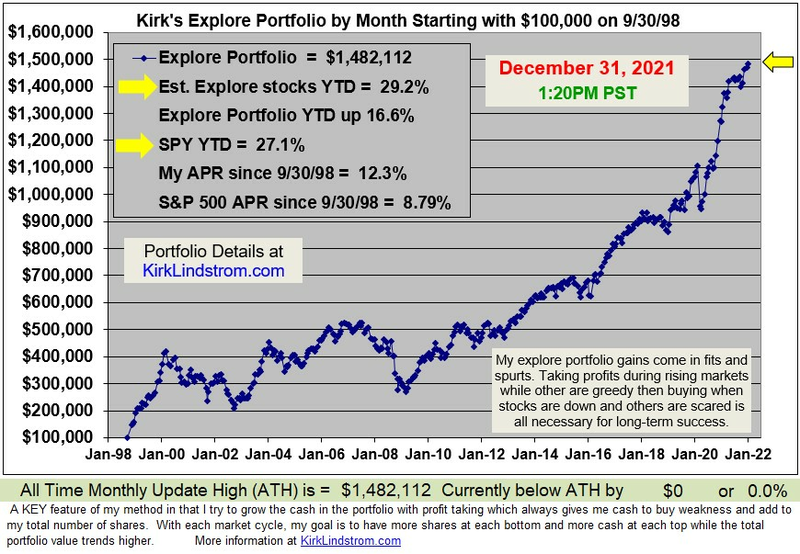 This strategy has worked out well for me this year as I am ahead of the market by about 8% YTD.